“Kalaupapa is located on the Kalaupapa Peninsula on the island of Molokai, Hawaii, at the base of some of the highest sea cliffs in the world; they rise 2,000 feet (610 m) above the Pacific Ocean. In the 1870s a community to support the leper colony was established here; the legislature required people with severe cases to be quarantined on this island in the hope of preventing contagious transmission of the disease. The area has been preserved as the Kalaupapa Leprosy Settlement and National Historical Park, which takes in the entire county. 90% of the world’s population has a natural immunity to Leprosy (Hansen’s Disease). Hawaiian’s did not. As a result, when exposed to this disease, it spread quickly and very little was understood about the disease and how it spread. Isolation was the answer and Kalaupapa was the ‘perfect’ place to isolate a segment of the population. Isolation for leprosy seemed like the best solution at that time, and came at a high personal price for the adults and children involved and their families. The original leper colony was first established in Kalawao in the east side of the peninsula. 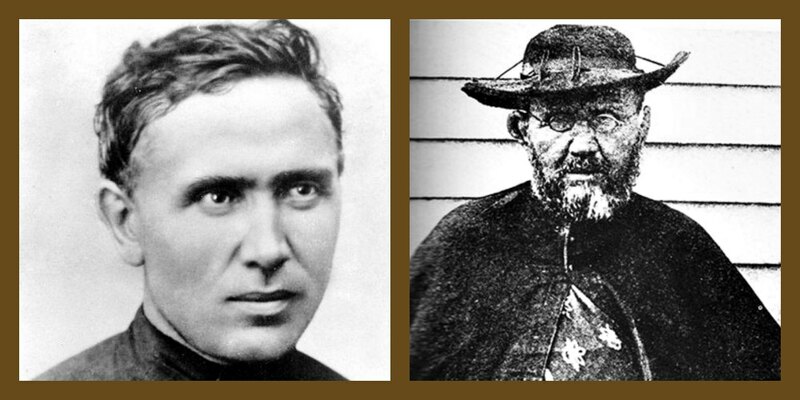 It was there where Father Damien was stationed and settled in 1873. Later it was moved to the location of the current village, which was originally a Hawaiian fishing village. Brother Dutton and Mother Marianne Cope arrived within several months of Damien’s death to help and to continue his work. At its peak, about 1,200 men, women, and children were in exile in this island prison. The isolation law was enacted by King Kamehameha V and remained in effect until 1969, when it was finally repealed. Today, about fourteen former sufferers of leprosy (which is also known as Hansen’s Disease) continue to live there. The colony is now included within Kalaupapa National Historical Park. This mandatory isolation stayed in effect until 1969 when it was to come to an end. The state legislature considered closing the facility entirely with the end of this isolation. Advocacy and intervention by interested persons persuaded policy makers to keep the facility running-which resulted in allowing the residents who chose to do so to remain there for life. The opponents to closure pointed out that, although there were no active cases of leprosy in the colony, many of the residents were physically scarred by the disease to an extent that would make their integration into mainstream society difficult if not impossible. Access to Kalaupapa National Historical Park has strictly limited access and requires prospective visitors to be aware of several critical pieces of information before planning their visit. Hawai’i State Law requires all visitors to secure a permit prior to entering Kalaupapa National Historical Park. Visitor permits can be secured through either Kekaula Tours LLC (Boogie Kahilihiwa-ph: 808 567-608) or Damien Tours, LLC (808 567-6171). For those flying into Kalaupapa airport, hiking the pali (cliff) trail, or riding a mule as part of the tour, permits may have been arranged in advance. Check with your transportation provider and tour company operator on the status of your permit. For guests of residents, this means submitting the proper permit application to the Board of Health Office. Persons that do not prearrange their visit to the park or who have not properly secured a permit will be denied access to the park. Persons under 16 years of age are not permitted to visit Kalaupapa. There are no medical facilities available in Kalaupapa Settlement. Any emergency medical response can take hours and may require a helicopter flight to O’ahu or Maui. There are no dining or shopping facilities available in Kalaupapa Settlement. All food and sundries must be brought in and all trash taken out. Visitors on Damien Tours LLC should bring their own water and lunch. The mule ride ride concession provides lunch to its customers. Visitors flying or hiking in must bring their own lunches. Guests of residents also need to bring their own food supplies. Snacks and soft-drinks are available to visitors at the local bar. Photography of patient-residents and their property is strictly prohibited without their express written permission. The 3.5 mile trail to the park is extremely steep and challenging with uneven surfaces. Rock and mudslides on the trail are common. Hiking the trail is physically demanding and careful consideration should be given to your physical fitness level before beginning the hike. Read more about trail safety here. Overnight accommodations are available only to guests of residents. Persons wishing to access the park (Kalaupapa) must prearrange their visit with either Kekaula Tours LLC (Boogie Kahilihiwa) or Damien Tours, LLC. Both tours are owned and operated by Kalaupapa residents, offers tours of Kalaupapa and Kalawao daily, except Sundays, Thanksgiving Day, Christmas Day and New Years Day holidays. Kekaula Tours LLC phone: 808 567-6088 and Damien Tours, LLC: 808.567.6171 for tour reservations and information. You can get to Kalaupapa by hiking down (you must prearrange your visit FIRST with Kekaula Tours, LLC (Boogie Kahilihiwa) or Damien Tours, LLC, or booking a ride on the Mule Tour (who will also book the ground tour) or flying in by way of Makani Kai Airline. If you live on Oahu or Maui, the Mule Tour can book a day trip for you that includes the air fare, mule ride and the ground tour. Whether or not your hike or ride down, the trail is on a vertical sea cliff that is about 1,800 feet high. There are 27 switchbacks on this trail which is approximately 3.5 miles each way. Be sure to wear appropriate outdoor clothing (and know that it can rain on you).